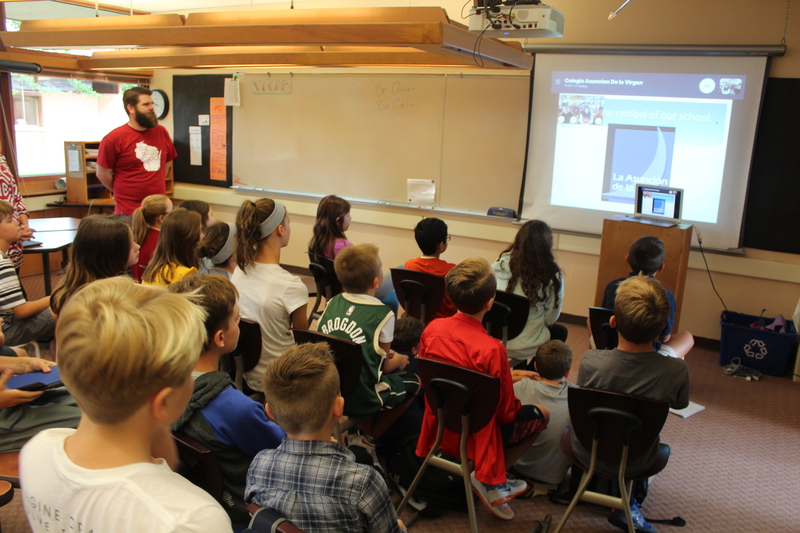 The power of technology connects TPS fifth graders with their counterparts in Argentina. To meet Dr. Seawright, and all the other amazing teachers at Prairie, prospective families interested in grades Pre-K through 12th are invited to visit our Fall Open House on October 21st from noon-3PM. It’s not everyday you get the opportunity to learn on two different continents. That’s exactly what Prairie’s fifth grade students did last week, during a special lesson in Dr. Gardner Seawright’s social studies class. It all started when Luca Morandi and his family — who attended Prairie for several years — moved back to Argentina this summer. Safe to say, Luca’s classmates have felt his absence during their transition from Primary to Middle School this fall. “This move happened pretty unexpectedly, and the Morandi family has been missed!” says Kathy Boero, Head of Middle School. Luckily, through the power of technology, reconnecting with Luca was an easy task. Dr. Seawright coordinated a Skype video chat with Luca’s teacher at Colegio Asunción de la Virgen in Olivos, Argentina — so students could chat about fifth grade, and school in general. But, as with most lessons at TPS, the learning didn’t end there. Seawright saw this as an opportunity for cultural exchange, and charged his fifth graders with creating a collaborative presentation to teach their new friends all about life at Prairie, in Wisconsin, and as citizens of the U.S. Their counterparts did the same. "There is something so simple and powerful about finding ways for students to step across international boundaries." So, when students arrived to class last Friday, rather than sit at their usual tables, they spread across two rows of seats at the front of the room — facing the SmartBoard screen. Dr. Seawright punched in the call, and after a few unsuccessful attempts, technology cooperated — and a solid video connection was established. Students in both classes waved at their computer screens, shouting “hello’s” and “how are you’s.” You could hear the burst of cheers and applause down the hall. And the smile on Dr. Seawright’s face spread just as wide as his students’. “There is something so simple and powerful about finding ways for students to step across international boundaries, even if it is only for a moment, to experience the wonderful differences of other cultures and the inevitable commonalities,” he says.